On October 10,, 2018, a FIRRMA pilot program was enacted that expands the scope of transactions subject to review by CFIUS to include certain noncontrolling investments made by foreign persons in U.S. businesses involved in critical technologies related to specific industries and mandates the filing of mandatory declarations for transactions that fall within the scope of the pilot program. Type of investments covered: The pilot program expands CFIUS’s jurisdiction to allow review of certain investments by foreign persons that do not constitute an acquisition of control of a U.S. business (referred to in FIRRMA as “other investments”). Foreign persons covered: The pilot program covers all foreign persons and is not country-specific. U.S. businesses covered: The pilot program covers any U.S. business that produces, designs, tests, manufactures, fabricates, or develops a critical technology that is: (1) utilized in connection with the U.S. business’s activity in one or more Pilot Program Industries (discussed below); or (2) designed by the U.S. business specifically for use in one or more Pilot Program Industries (“Pilot Program U.S. Businesses”). The pilot program covers all critical technologies, as defined by FIRRMA, of Pilot Program U.S. Businesses, including emerging and foundational technologies controlled pursuant to the Export Control Reform Act of 2018. 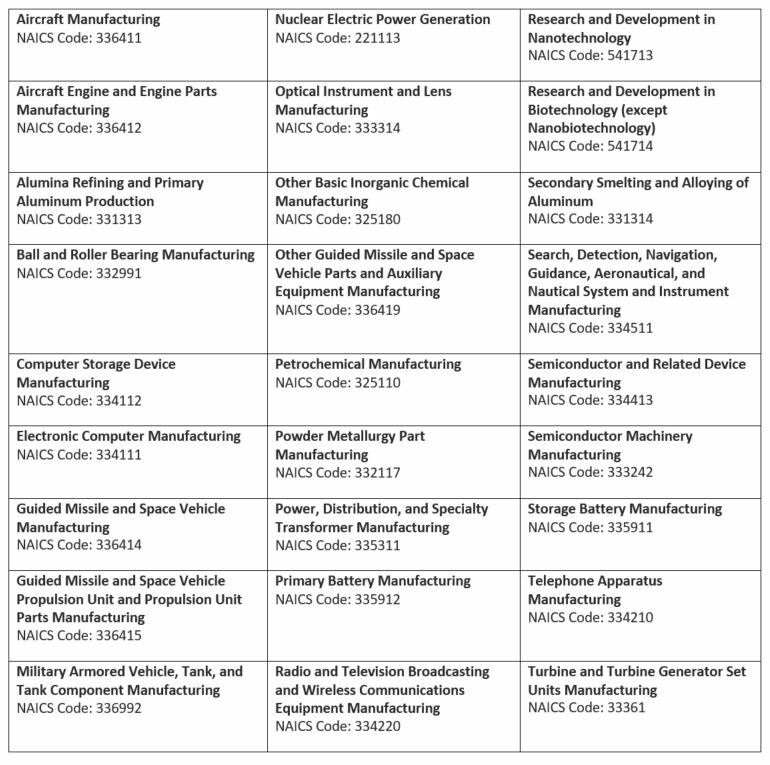 Industries covered: The pilot program covers 27 industries, identified by their respective North American Industry Classification System (NAICS) code (“Pilot Program Industries”). Mandatory declarations: The pilot program establishes mandatory declarations (i.e., abbreviated notices that generally should not exceed five pages in length) for foreign transactions involving Pilot Program U.S. Businesses that are within the purview of CFIUS (i.e., both controlling investments and “other investments”). Declarations must be filed at least 45 days prior to a transaction’s expected completion date. The Committee will have 30 days to take action. Parties may choose to file a notice under CFIUS’s standard procedures rather than a declaration. Parties that are required to file with CFIUS and do not do so can be assessed a civil monetary penalty up to the value of the transaction. The pilot program commenced on November 10, 2018. It will end no later than the date on which the final FIRRMA regulations are implemented.